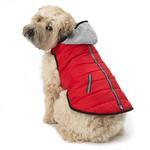 Protect your dog from the elements with the stylish Stowe Puffer Dog Coat - Red! The Stowe Puffer Dog Coat - Red is a great way for your dog to stay warm and dry with its poly filled fleece lining and water repellent quilted outer-shell. 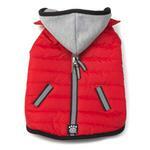 Its removable hood gives you easy comfort control when going from harsh elements to the indoors or vice versa. 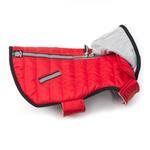 The 2-Way zippered harness opening makes for easy harness attachment. It features wide reflective tape for easy visibility in low light conditions and its adjustable Velcro® makes it easy to take off and put on. It is also machine washable and made of 100% polyester.